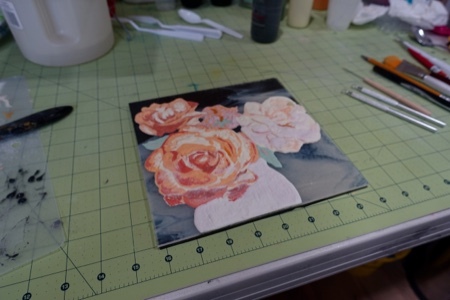 While my last project is in the kiln slumping I have now started a palette knife painting of some of my spring roses. I have never taken a class in this method but I have done a couple of these on my own a few months back but using Aloe Vera Gel. Now I’m using VitriGel which I like much better and its not that much more expensive then Aloe. Below are some photos of the beginning steps of this project. I will add more photos as I move along in the process. 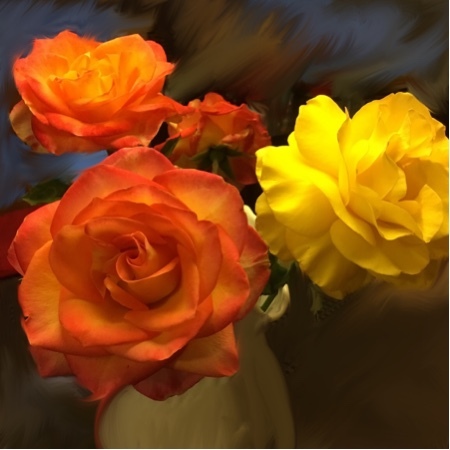 My photo photoshopped with background stuff removed and vase shape changed. 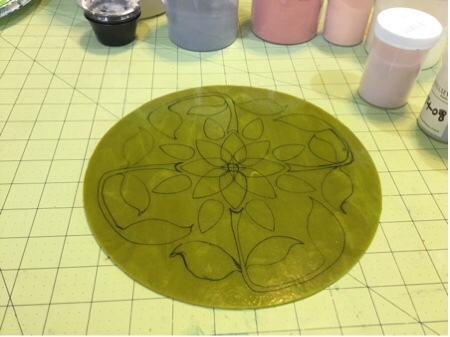 Bullseye glass of clear and vanilla overlaying tracing. Palette Knife painting in process. Check back for updates on this project. Finally got back to this project after the holiday weekend. 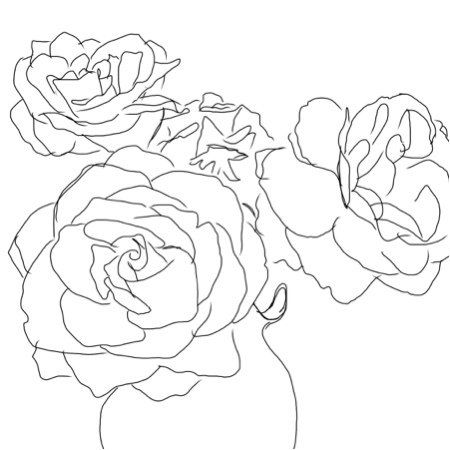 I finished up the roses and added some leaves. 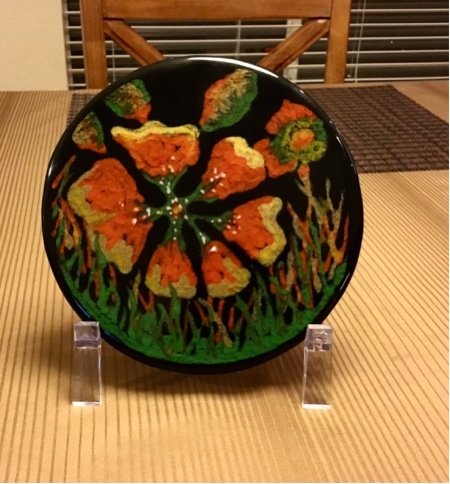 I found a piece of black glass in my stash and decided to use that for my base color. I’m not totally committed to the black yet. I have a long wait until I can get some more clear frit for the top layer. Everyone is out of stock. So I’m still deciding whether or not to just fuse this piece without the clear on top or not. So again keep checking back for the finished piece. 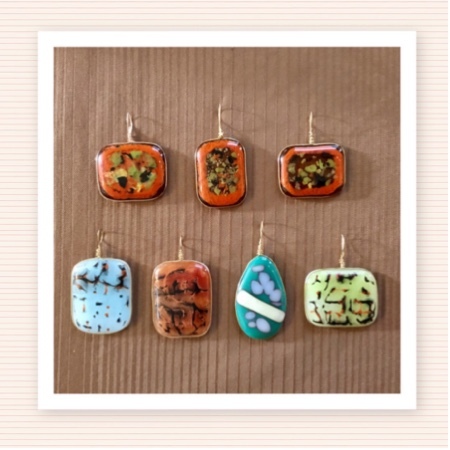 Pendants are a great way to use up left over supplies from larger projects. Sometimes trash becomes treasure. 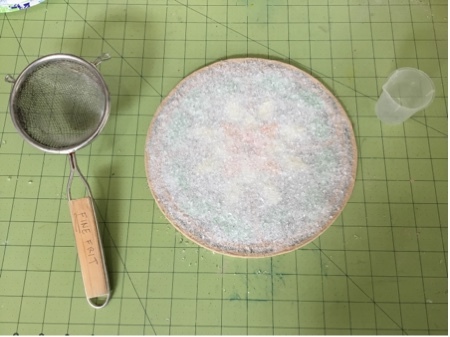 Leftover gel and powder paints that dry in cups overnight can be popped out of the cup and crushed up to make speckles and flakes of color to be used in other small projects such as jewelry. 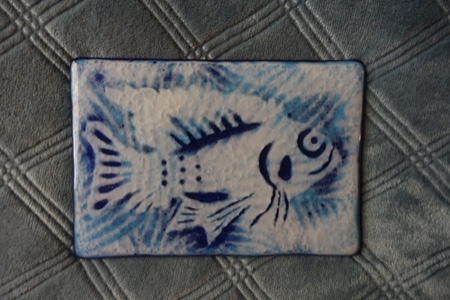 Also bits of frit and enamel paints can be used. These pendants were all made from stuff left on my table. Be sure to stop and think before you toss what looks like a mess into the trash can. 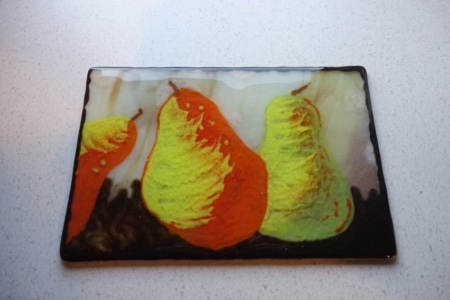 This is another Powder painted fused glass piece. I did this on a 7” black circle. 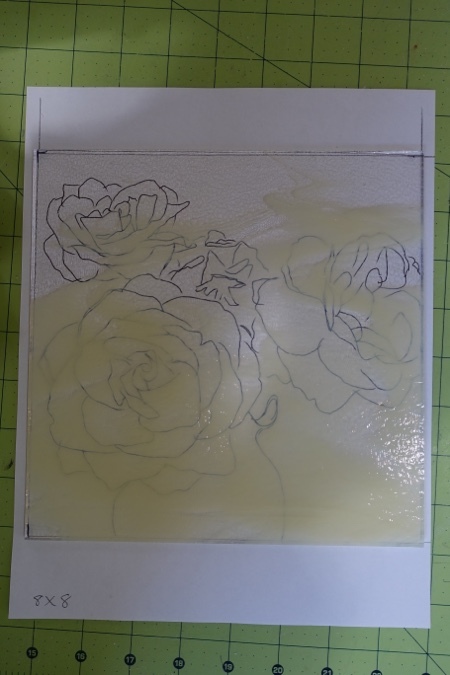 I used Dritz sewing white carbon like tracing paper to copy my design onto the black glass. That worked great. It was a suggestion someone made on one of the Facebook glass groups. Sorry I dont remember their name to give credit. Anyway next I mixed up my Vitrigel and different colors of glass powders. 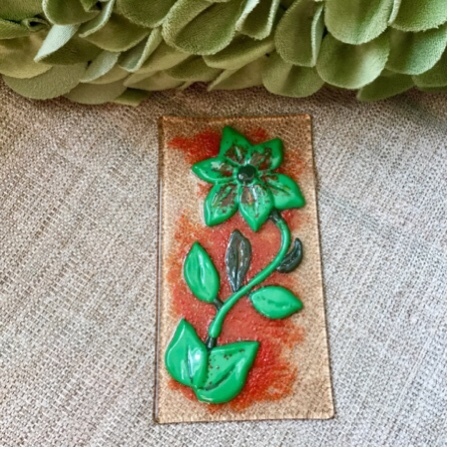 I used squirt bottles to paint my design and a couple of clay tools to move it around with. I layered clear frit on the piece and full fused. No problem with bubbles on this one as it is only one layer of base glass plus all the frit. One fuse and probably one more for slumping, probably into a wavy bowl. 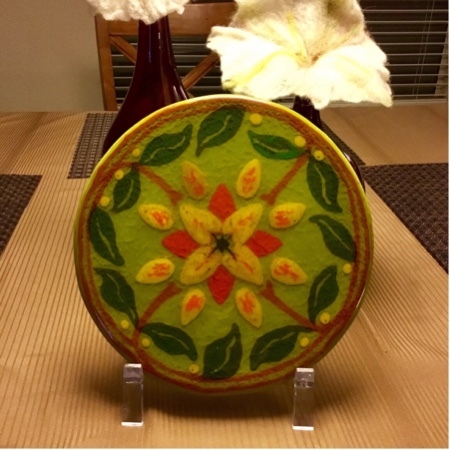 These cabachons were made from scraps. I dont like wasteing glass so I used the powder and gel paint that dried in the mixing cups after it dried hard. I cracked it away from the sides of the cups. 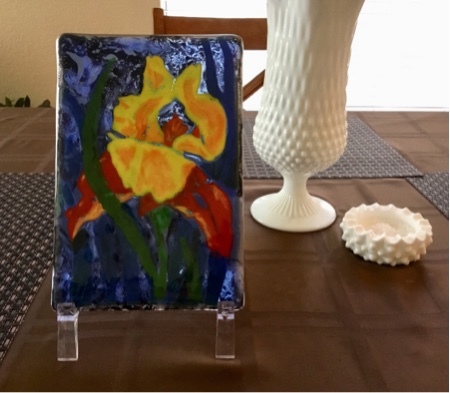 I used a scrap transparent piece yellow gold glass for the base and used left over squirt paint for the edges and then filled in with the glass flakes from the cups and covered with clear frit and full fused with the flower piece above. Check back soon to see the fantasy flower bowl slumped. 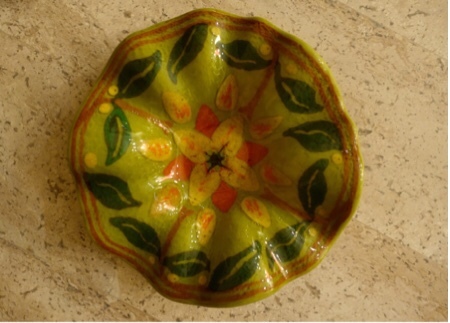 Its now slumped into a nice bowl, arty and functional. 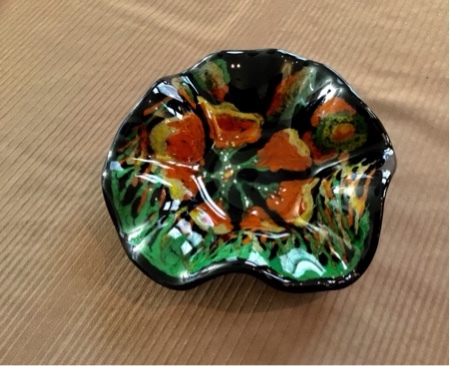 Its great for a salsa bowl, dip bowl, candy bowl etc. I am very happy with my slumping schedule. It fully slumped to the bottom with a nice flat bottom. This was quite a challenging piece. I started with a 6x9 clear base and a transparent dark blue top piece. On the clear base piece I used Vitrogel and glass powder mixture to create a background mottled texture. I just used a palette knife to move the mixture around until I like it. 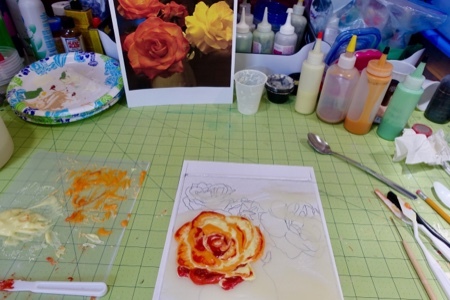 Then I began painting my flower with the Vitrogel and powders on the blue panel. I dried these pieces thoroughly. I decided to add leaves on the backside of the blue panel so they would be in the middle layer giving the piece some depth. I used my colorline white paint to do the leaves. That way it created a shadow effect by making those leaves opaque blue. I then fired these two pieces seperatly but together in the same kiln. After the two pieces were fired I put them together and did a contour fuse. 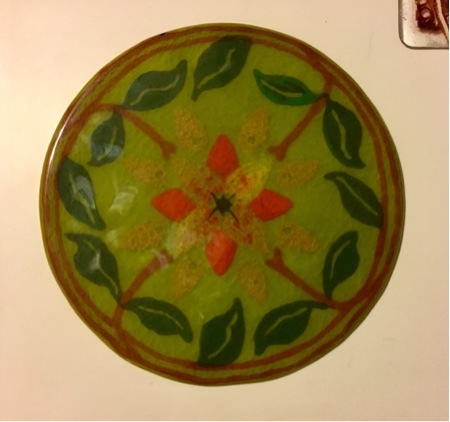 I wasnt quite happy with the piece yet so I added more leaves to backside and added green leaves to front side creating more depth. I contour fused this again but the green leaf kind of curled up on the edges and made a sharp edge. Not good. I ground the sharp part off did a little more painting with powders and full fused a last time. I am pretty happy with the piece now except one miner booboo. When I fired the first two seperate pieces the edges shrank in slightly and made a slightly thicker edge. So when I put the two pieces together there was an air pocket left between the two pieces. I was not observant enough at the time to notice that. When the two pieces were fused together bubbles were created. The only unusual thing about that was the bubbles are only in the background area around the flower not behind the flower anywhere???? Also no bubbles around the 1/2 inch border. At least it looks almost like the bubbles were intentional in the area where they occurred. That’s my story and I’m sticking to it. Next time I will top the back layer with clear frit to even it up level all the way across to eliminate that air gap. The next new product I have tried is Glass Bird Modeling Glass. It is a 2 part powder and liquid that you mix with your glass powders. It is easy to mix up but you need to follow the recipe carefully. It turns into a glass clay somewhat like playdough. 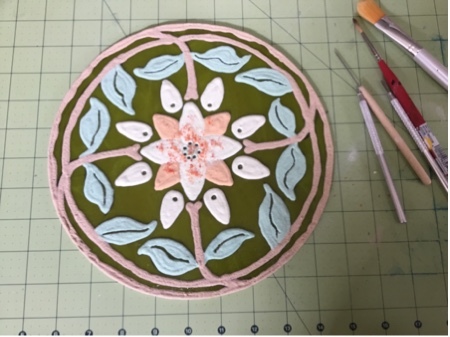 You can roll it out and cut it, you can make coils, you can make flower petals, you can cast in molds. After its dried you can carve and sand it. Its an awesome product if you want a sculptural or textural quality to your glass pieces. 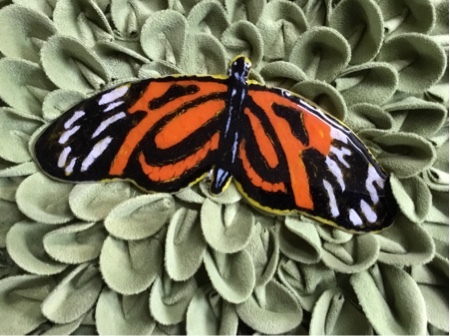 The photos below are just a quick project to try out the product. I cut the recipe in half and only made 1/4 cup. 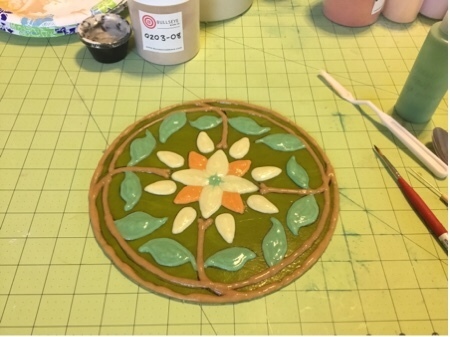 I kneeded the glass clay and then rolled it out and free hand cut some petals and leaves and made a coil for the stem. 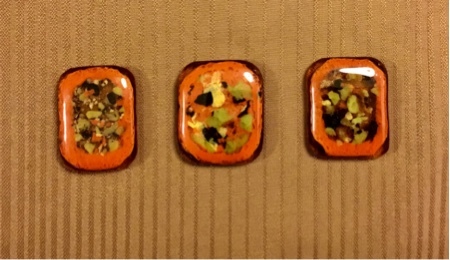 I dried all the pieces first in my oven on a silicon matt at 200 degrees. 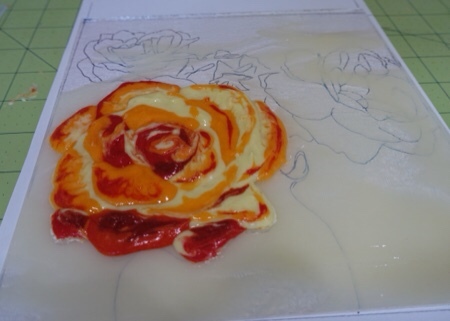 When dry I placed the pieces on a transparent scrap of rose glass. I contour fused at 1400 in my fiber kiln. Not realizing that the pieces shrink 15% and move around, they seperated. So it is probably best to fuse your pieces before putting them on the base glass. DAH! Well not to give up on this piece I just added more to it and redried and refused it. No problem! Second fuse with a different green color blend. 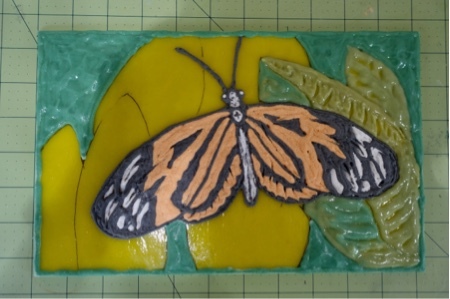 This is about an 8” butterfly I hand cut out of opaque yellow glass by hand...not by saw. When trying to cut such a complicated shape it broke into 4 distinct pieces that fit cleanly back together. 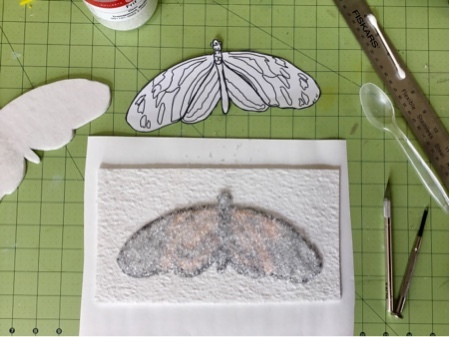 I cut a dam out of 1/8 inch fiber board with an exacto knife to hold the pieces together so they would not seperate in the fusing process. It was a gamble but worth the try. First I tacked the pieces together with the vitrigel. 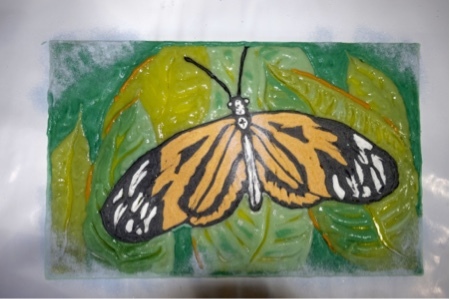 Then I preceeded to paint the butterfly with the vitrigel and glass powders. I thoroughly dried the piece in the oven at 225 degrees for about 25 minutes. Then covered the whole thing with clear frit and fired at a full fuse schedule. All the pieces fused back together nicely. Now I would like to attach some wire antennas. 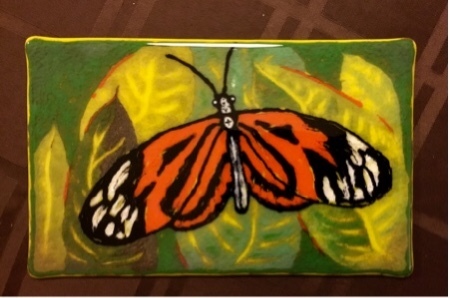 The next butterfly piece I did was on a rectangular piece of opaque yellow glass. 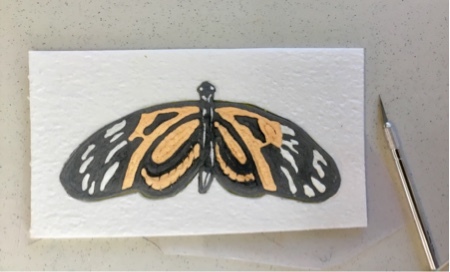 I used my same butterfly pattern that I had drawn for the cutout one above but added the subtle leaf backgound. Again I used the Vitrigel and powders to do the artwork. Below are some photos of the piece in progress. An experiment gone wrong??? Maybe not. I tried using a cookie cutter I thought was stainless steel for a dam but as you can see it was not. It was tin coated. Fortunetly I lined the inside edge with kiln paper so the glass actually turnd out OK all the tin coating burned off cleanly so maybe if I kiln wash it and lined it I could use it again. Would the steel give off dangerous fumes? I don’t know. Guess I better check into that. 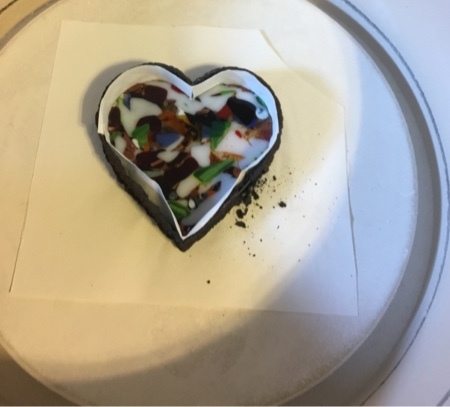 Here is the photo of the heart. 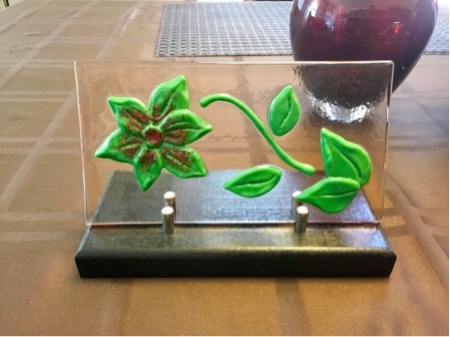 It is about 5” and made from scrap glass. Its been awhile since I’ve posted. I know you should post every day but that’s just not how my life is. Honestly I don’t think you all have time to read posts daily either. 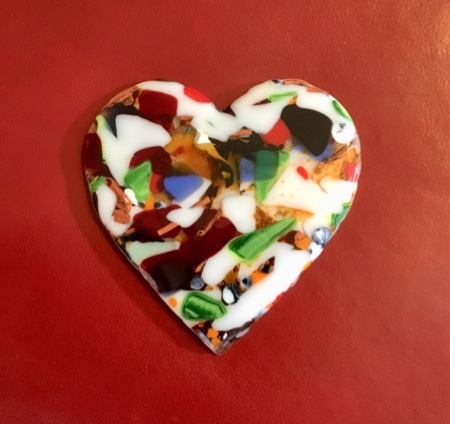 So here goes my fused glass update. 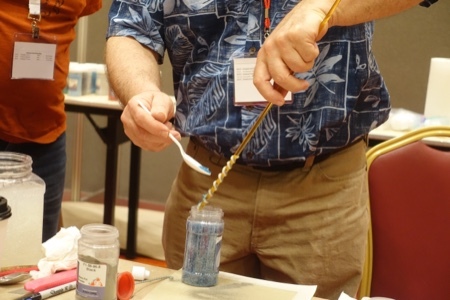 In my last post I talked about a class I took in Las Vegas at the Glass and Bead Expo. Today I am talking about the second class I took there. Below are some photos from the class. 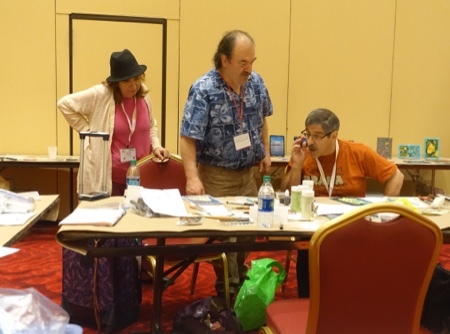 The class was called Fritography with a Twist with Michael Dupille as the instructor. 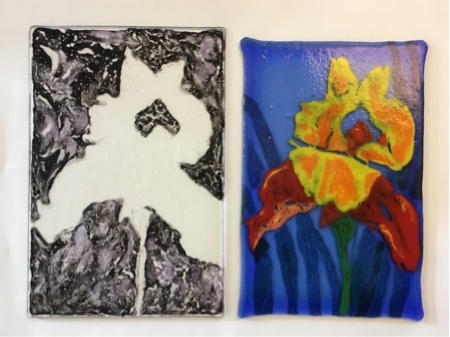 I can’t give away his secrets but I can say that we used his product called VitriGel with glass powders using two different techniques of creating art on fused glass. I love using the product. I’ve been using aloe vera gel for powder painting techniques but this gel is much much better. 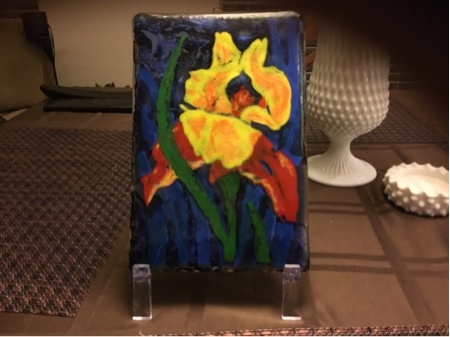 I am so interested in creating fine art with fused glass and this class was right up my alley. Below are my first pieces I did in the class. I don’t do my best work in a class situation but it was fun and my pieces aren’t too bad. Check them out below. You can go to Michael Dupille’s website to purchased his products and videos I just purchased his beginning Fritography Video and can’t wait to receive it.